With no large hotels, Bonaire has remained prestigious and laid back. Here you can enjoy the views of the marina while chilling out in the bars and restaurants. Located within easy reach of a wider selection of bars, restaurants and supermarkets in the old town of Alcudia and further on into the Port of Alcudia. Surrounded by protected forests, mountains and 2 sandy beaches leading to the peninsula of La Victoria and its mountainside restaurant, a perfect location to watch the sunset. The 2 sandy beach coves of Es Mal Pas are a well-kept secret from the masses boasting crystal clear waters ideal for snorkelling, kayaking and diving. For the golf enthusiasts, Aucanada golf course is only short drive away.With no large hotels, Bonaire has remained prestigious and laid back. Here you can enjoy the views of the marina while chilling out in the bars and restaurants. Located within easy reach of a wider selection of bars, restaurants and supermarkets in the old town of Alcudia and further on into the Port of Alcudia. Surrounded by protected forests, mountains and 2 sandy beaches leading to the peninsula of La Victoria and its mountainside restaurant, a perfect location to watch the sunset. The 2 sandy beach coves of Es Mal Pas are a well-kept secret from the masses boasting crystal clear waters ideal for snorkelling, kayaking and diving. For the golf enthusiasts, Aucanada golf course is only short drive away. 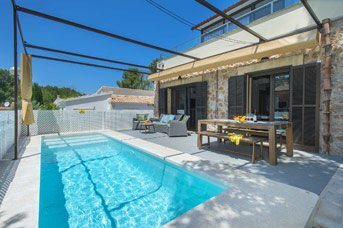 Bonaire, situated only a 10- minute drive away from the old town of Alcudia and 15-minutes from the Port of Alcudia, is a quiet residential area set on a hillside in the north of Majorca. The 2 small beaches offer sunbeds and parasols and small chill out beach bars with lifeguard and toilet facilities. The resort has its own diving school located on the main street, in the centre of the resort. Alongside the diving school and close to the small harbour, there are a couple of restaurants offering international cuisine. For the adventurous, there is a rocky walkway linking the 2 bays that can be followed to Bacares, a small area at the back of the old town of Alcudia, or take a hike or drive from the back of Bonaire down to the coastline where you can visit the Museum of Sa Bassa Blanca, home to art, gardens and the Ben Jakober sculpture park. Further on there is a cliff trek to the secluded beach of Coll d’en Baix. Walking or driving through Bonaire heading up the mountain takes you to the La Victoria peninsula and monastery with various walks and the well-known restaurant at the top called La Victoria, a great spot to watch the sunset from their restaurant terrace. 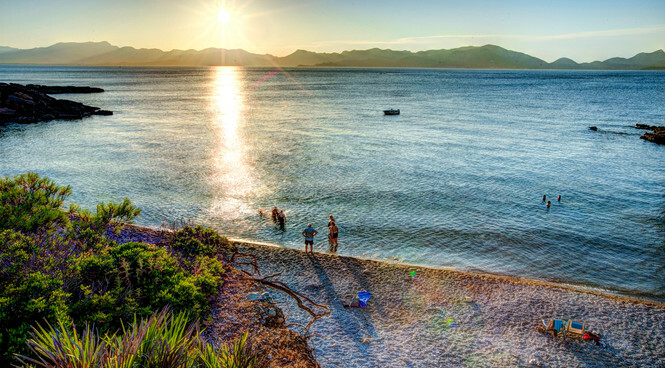 The old town of Alcudia and the port being nearby gives you the chance to venture further afield to enjoy a more varied Spanish cuisine and with a larger selection of restaurants and cafes, shops and bars.